We were invited to a friend’s wedding to be held in Queensland. We decided to drive and visit some relations on the way up and after the wedding to check out some of the Queensland tourist attractions. Milton, the place where my father grew up. I always loved coming here in the January holidays when my father’s factory always took their annual break. The trip in the car seemed to take forever but seeing my father’s side of the family, the farm and the country town of his childhood made up for it. 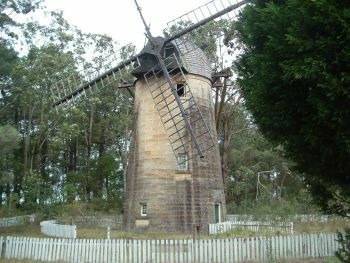 A more recent shot of the windmill. Possibly taken around 2005. Old Sydney Town is a historical theme park representing Sydney some years after the first convicts arrived at Botany Bay. It’s not as well-developed as Sovereign Hill but it was on the way. Sadly on Monday January 27, 2003 the park was closed to the public. Two years later and now it’s oddly being marketed as a movie set. The website photos show that the buildings have deteriorated but the weathering makes them look more authentic. I suspect that visitors did not want to be reminded of Australia’s dark past which included imprisonment and capital punishment. Compared to Sovereign Hill and Timbertown the era covered by Old Sydney Town is rather bleak. Timbertown in Wauchope, Queensland is my second favourite historical theme park (my favourite is Sovereign Hill). The buildings look authentic and there’s even a steam train to ride. The scones made there were some of the best I’ve had, at least when we went. Well worth a visit.